NILES, John Milton(1787-1856) was a lawyer, editor, author and politician from Connecticut, serving in the United States Senate and as United States Postmaster General 1840 to 1841. SMITH, Perry (1783-1852) was a Connecticut State Representative and a Democrat to the United States Senate. TOUCEY, Isaac (1792-1869) was an American politician who served as a U.S. senator, U.S. Secretary of the Navy, U.S. Attorney General and the 33rd Governor of Connecticut. PHELPS, Lancelot (1784-1866) was a United States Representative from Connecticut. HALEY, Elisha (1776-1860) was a United States Representative from Connecticut. 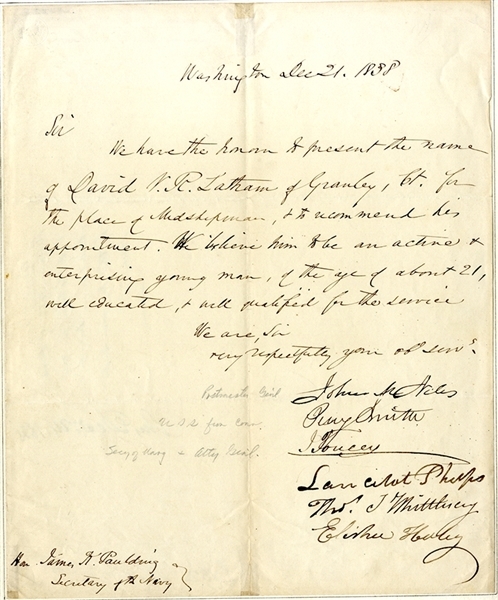 Manuscript Document Signed “John M. Niles”, 1pp. quarto, Washington, December 21, 1838, addressed to Secretary of the Navy James K. Paulding, and reads in part: “...We have the honor to present the name of David V. R. Latham...for the place of midshipman & to recommend his appointment...” Inlaid, else very good condition.